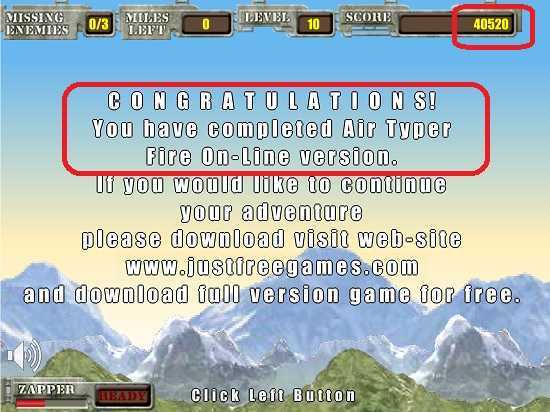 To begin playing Air Typer, click the Small, Medium, or Large link or PLAY GAME button under the picture at left. This opens the game in a pop-up window. Click the "New Game" link to begin. This really is a typing game. So if you're not a fast typer, you might not last long! But try it anyway. It's a fun way to give your brain a boost. This game trains visual attention and reaction time. If you like this game, you might enjoy the other free word games on this site, such as Alpha Attack and Piano Bar. HOW TO PLAY. Place your hands on the keyboard, and type the words on the enemy balloons as they appear. Don't let more than three balloons slip past, or your plane will go down in flames! To start the game, click the "New Game" link. 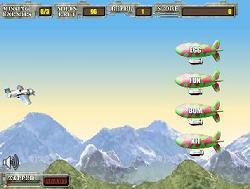 When you see your airplane, click the left mouse button to begin the round. Put your hands on the keyboard right away, and get ready to type. The progress bar at the bottom is the "Zapper". When the bar is full, you can press the Spacebar to instantly blast all the enemies on the screen. At the end of each level, the game computes your typing accuracy. For example, 94%, 82%, or whatever. When you are ready to start the next level, click the left mouse button. UPDATE. I finally beat this game, with 40,520 points! Wow, that was tough. To complete the game, you have to finish Level 10. At that point, there are 7-letter words attacking you en masse. I definitely had to use the Zapper just about every time it became available. Air Typer really forces you to concentrate. Plus it could certainly improve your typing accuracy and speed. A simple yet fun brain game. I love the peppy background song on this game. It's the kind of song that sticks in your head all day. Game distributed by Games-for-Free.net. Used with Permission.